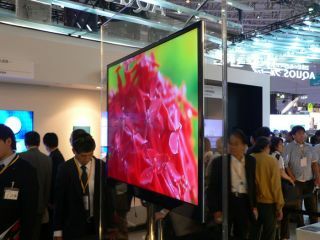 Not content with cranking out mega-high-res mobile phone screens, Sharp has also chosen this week to unveil an entirely new kind of LCD panel that can show images even when the power is cut off. The company's prototypes are capable of showing up to eight colours without using power to maintain the display and come in sizes ranging from 1.7 inches up to 14.1 inches. By enabling such a 'memory effect' Sharp hopes to create a niche in the retail market. It gave the example of price tags on shop shelves that could be easily updated via Wi-Fi across an entire supermarket. Similar tags using electronic paper already exist, so Sharp clearly has at least one other emerging technology in its sights. So, far the new LCDs have been tested only in Osaka in western Japan, but other field trials and different applications are sure to emerge soon.